geocaching.com is changing its API to access its data to another technology. That would be a major change to the app. Due to the decreased importance of Windows Phone / Mobile and the resulting reduced user base, the effort for this migration is too high and is therefore not carried out. The maaloo Geocaching app will not be able to communicate with geocaching.com after 1 May 2019. We regret the move, but we have no influence over the decisions of geocaching.com. After 1 May 2019, you can only use the offline functionality of the app. You can import pocket queries (GPX-files) and use them without online connection. The same happens for the geocaching functionality of maaloo Outdoor. I hope you enjoyed the app so far and will have it until 1 May 2019 or maybe even beyond. maaloo Geocaching is now free. You do not have to pay anything to use the full version. I hope you like that. 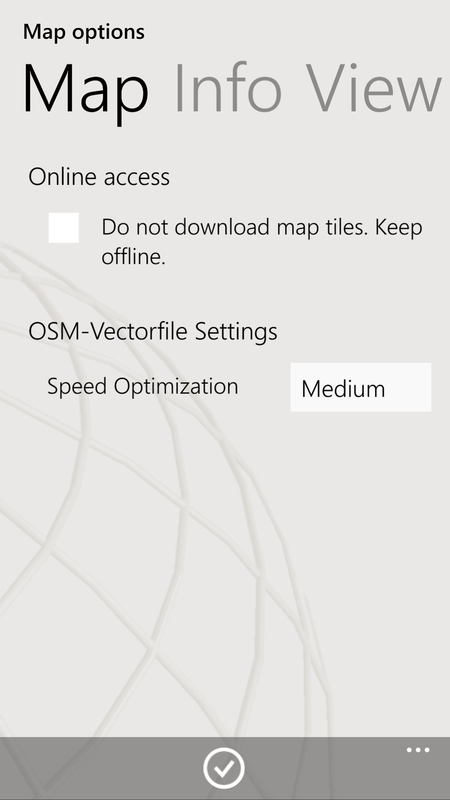 The default map is now the OpenStreetMap “Normal” map, because of problems with the HERE map on newer devices. The ‘View Online’ feature is not available for Basic members of geocaching.com. The lost of the GPS-signal is now alerted by voice and vibration. The Favorites / Waypoints page has a redesigned application bar. There is a new button to activate the multi selection mode and one more button to select all or de-select all items. You can elect the selected waypoints as your favorites, which copies them to the favorites folder. The pixel offset in the OSM-map of the Lumia 950 device (RM-1105) is detected automatically now. This update offers 2 new filters for Geocaches. The Cache-Size and the Min-Favorite-Points filters. The selection of all sizes automatically includes the Unknown-size. The other new features are the fast map and themes switcher, introduces with the v2.9.3 of the Outdoor version. Corrected coordinates of mystery caches in geocaching.com are visible again on the map and in the details of the cache. A Timeout-message appears if the request for caches on the map is not responded in a certain time (see Seetings / Online / TimeOut Message Limit). This re-enables the next request faster. Panoramio is no longer available. The former features for Panoramio are excluded now from the app. This update offers some improvements and bugfixes for Geocaching and the Geocaching-InApp. The Log Upload page has 3 buttons to enable or disable the upload for notes, logs and trackables logs. The upload process itself checks for errors from GC-API and marks the logs having an upload-error not as uploaded, for your next try (with better WLAN connection). The quality of the GC-icons has improved. You will notice this especially on phones with higher resolution.